When unplanned expenses put a strain on your budget and leave you short on cash, a payday loan can ease the pressure. 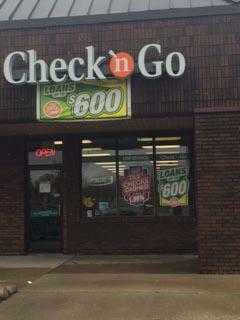 In Mount Morris, Check `n Go payday loans are available from $50 to $600 to help you through those tough times. Our full product line includes payday loans, cash advances and check cashing. Apply online and you could have funds deposited in your checking account as soon as the next business day. * Or, stop by our Mount Morris location and apply today and once approved you’ll receive your money in person. *We are easy to find, located near Save-A-Lot in Mount Morris Town Centre Plaza. If you have a current ID, verifiable source of income, an active checking account and a working phone, you can apply for a Check `n Go Mount Morris loan right away. The process is quick, easy and worry-free. Contact us today and help take the worry out of tomorrow.